Elwood Ransom Coleman, Jr., age 65, born August 3, 1947 in Jasper, Florida to Elwood and Merle Anita Young-Coleman, passed away peacefully on Sunday, April 7, 2013 in Houston, Texas after a courageous battle with leukemia. Elwood proudly served his country with the U. S. Army and retired as a Command Sergeant Major. During the last several years in the military, Elwood earned numerous awards as an instructor at the Sergeants Major Academy at Ft. Bliss, Texas. Following his military service, Elwood completed his working career in New Orleans, Louisiana with the Orleans Parish Sheriff's Department. He was also a very proud member of the Sons of Confederate Veteran's, following the lineage of military service of his great-grandfather, Pvt. William Allen Coleman of the First Georgia Cavalry who served in the Civil War. A visitation will be held today from 5:00 p.m. - 9:00 p.m. on Thursday, April 11, 2013 at Joseph J. Earthman Generations, 234 Westcott Street. A funeral service with full military honors will be held at 9:00 a.m. on Friday, April 12, 2013 in the chapel of Houston National Cemetery, 10410 Veteran's Memorial Drive, Houston, Texas on Friday, April 12, 2013. 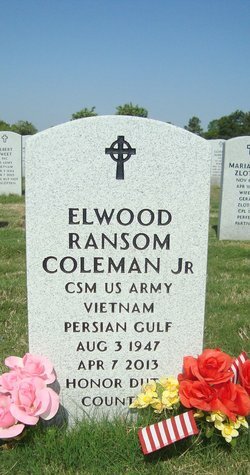 Grave marker for Elwood Ransom Coleman, Jr. in Section U, Site 0369 of the Houston National Cemetery, Houston (Harris County), Texas. Jan 83-Feb 86 C Co.1-508.